Wonderful shot, Pat. Could they possible be father and son? Beautiful Pat. I love the color, light, background and sharpness. Such beautiful light on those great-looking animals. I definitely love the iris accents too. Thanks, Anonymous! I suppose it's possible since they appear to be different in age. With the mating structure of a just a few dominant bulls for the year producing offspring, it's hard to say who might be related! Thanks, Jim! I was able to get the dunes of Dillon Beach across Tomales Bay behind them for these shots. It makes for a far more interesting background than a plain sky in my opinion. Thanks, John! I was hoping to find the elk among the wildflowers on this trip. Thanks, Iain! 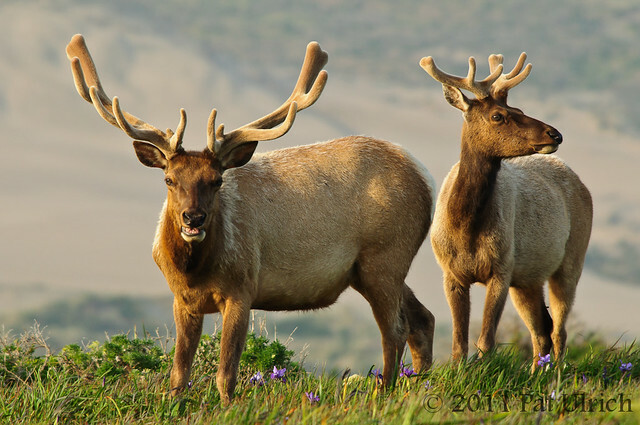 It is a real treat to have so much wildlife just a short drive away from San Francisco!